Status: Fairly common regular spring migrant west and central, rare east. Uncommon regular fall migrant west and central, rare east. Documentation: Specimen: UNSM ZM6221, 23 Jun 1916 Mitchell, Scotts Bluff Co. There are later reports 6 Jun 1908 Lancaster Co, 10 Jun Garden-Sheridan Cos, 12 Jun 1992 Sioux Co, 13 Jun 1992 Sheridan Co, 15 Jun 2003 Kiowa WMA, Scotts Bluff Co, and two males on 19 Jun 2004 Lake McConaughy, Keith Co. June records are discussed in Fall (below). 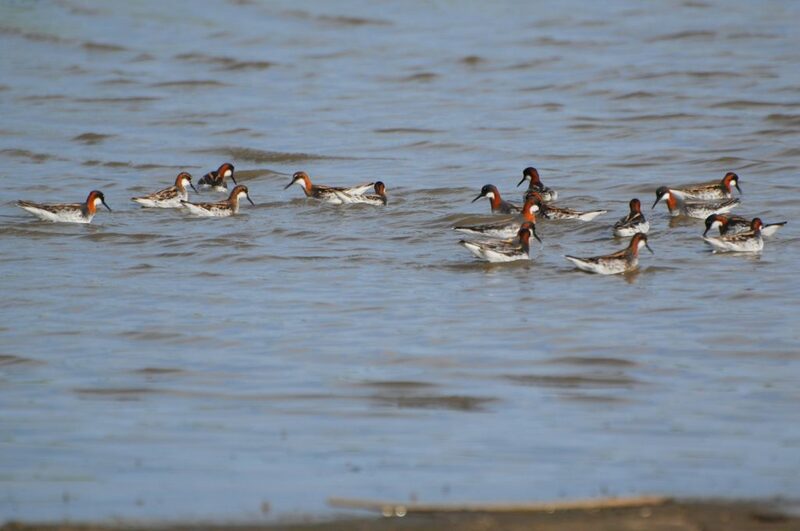 A relatively late migrant, the Red-necked Phalarope does not usually arrive until the second week of May and peak migration occurs during the third week. Around 75% of the reports fall within the short period 15-23 May. There are about 35 reports from the east. High counts: 460 in Sheridan Co 18 May 2004, 388 at Crescent Lake NWR, Garden Co 15 May 2006, and 250 there 22 May 1997. There are earlier reports 11 Jul 1973 Sheridan Co and 17 Jul 1979 Garden Co, and later reports 24 Oct 2015 a juvenile Harlan Co Reservoir, Harlan Co, and 31 Oct 2002 Niobrara SL, Knox Co. Reports prior to mid-Aug are from western Nebraska, presumably adults, with a single exception, 30-31 Jul 1998 Schilling WMA, Cass Co. Later reports are more numerous and widespread and are mostly, if not all, juveniles. In eastern and southern Nebraska juveniles are the most likely age to be encountered; three sight records in 1995 and two specimens, all in Sep, were juveniles. The five eastern Rainwater Basin records are of juveniles (Jorgensen 2012). Reports after the first few days of Jun may be females, which leave breeding areas as soon as mid-Jun, and may be followed by failed breeders and males (O’Brien et al 2006). Such reports are 23 Jun 1916 alternate male (specimen cited above), two on 23 Jun 2004 Kiowa WMA, Scotts Bluff Co, and 28-30 Jun 1985 Sioux Co. Alternatively, the few reports during this period may represent individuals that discontinued spring migration. High counts: 45 in Sheridan Co 21 Sep 1996 (Grzybowski 1997), 29 at Lake McConaughy 14 Sep 2007, 22 there 9 Sep 2000, and 22 there 26 Aug 2006. Red-necked Phalaropes in the Rainwater Basin 14 May 2008. Photo by Joel G. Jorgensen.